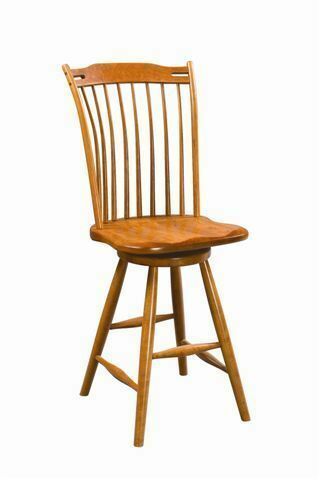 This Amish Holliston Thumbback Swivel Bar Stool is a slat back Windsor chair style from the 1800s. This beautiful Amish built Windsor Bar Stool is handcrafted using solid wood. The Amish made bar stools are beautifully finished for a magnificent dining room appeal. Move with ease seated in this swivel bar stool. Reach for items easily at the Friday night card game with a set of these stools around your gathering table. Take a look at our beautiful collection of Windsor furniture here. We offer Windsor style furnishings for many areas of the home. Get comfortable at the bar area in this Holliston Thumbback Swivel Bar Stool. Rest your feet on the solid wood stretcher and visit a while. This Amish handcrafted Barstool features a return swivel running on ball bearings. These stools are great kitchen bar stools and the swivel option provides movement while you are sitting. When you are seated for some time, it is natural to feel the need to move around a bit which a swivel bar stool can accommodate! Choose from a 24" counter stool or a 30" bar stool height. We offer a wide variety of hardwood stool styles as well as bars and pub tables. Call us today, toll-free at 866-272-6773 for assistance with your order. We look forward to speaking with you.